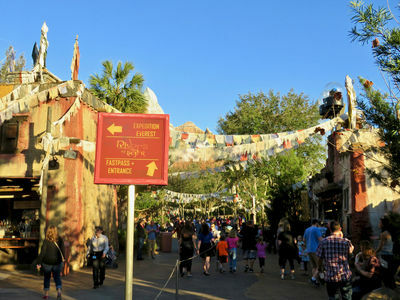 Writer's note: This was a huge week for Walt Disney World announcements: big, exciting ones like the long-delayed debut of Rivers of Light at Disney's Animal Kingdom (February 17) with "surprise," unpublicized pre-debut showings (starting with a so-called "soft opening" that began on February 10); the upcoming debut of a brand new fireworks show at Magic Kingdom named Happily Ever After on May 12, replacing the long-running Wishes, which will end May 11; the official opening of Pandora – The World of AVATAR (May 27); and the announcement that Star Wars Land is on track to debut in 2019 at Disney's Hollywood Studios in Florida (and Disneyland in California). Speaking of Disney's Hollywood Studios, a nine minute preview of the upcoming live action version of Disney's Beauty and the Beast began playing at One Man's Dream's Walt Disney Theater with some newly added props and costumes to view outside the theater while awaiting the preview. 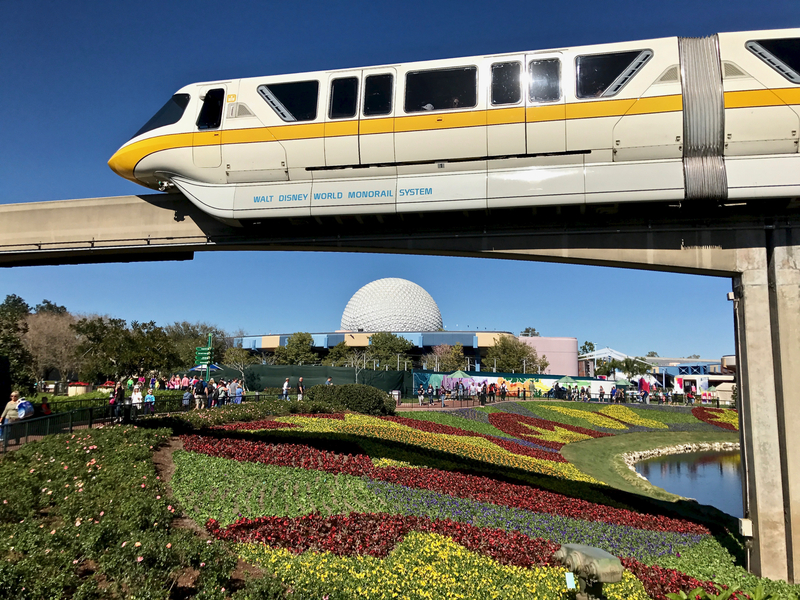 The first ever Epcot International Festival of the Arts heads into its final weekend (February 17-20) with preparations for the 2017 Epcot International Flower & Garden Festival well underway for its debut just over a week later (March 1). 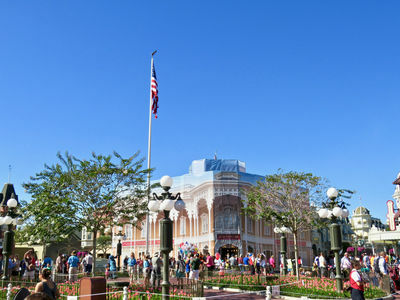 And, oh yeah, on Sunday this past weekend, Disney Parks "quietly" raised some admission prices for all of its theme parks in the U.S.A., changed some ticket options (including some price decreases), and increased the cost of Preferred Parking at the parks. 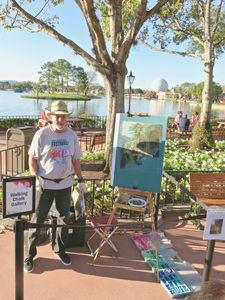 So, get comfortable, we have a lot to cover, plus One Passholder's Tip and lots of photos too. Just in case you forgot: Happy Valentine's Day. 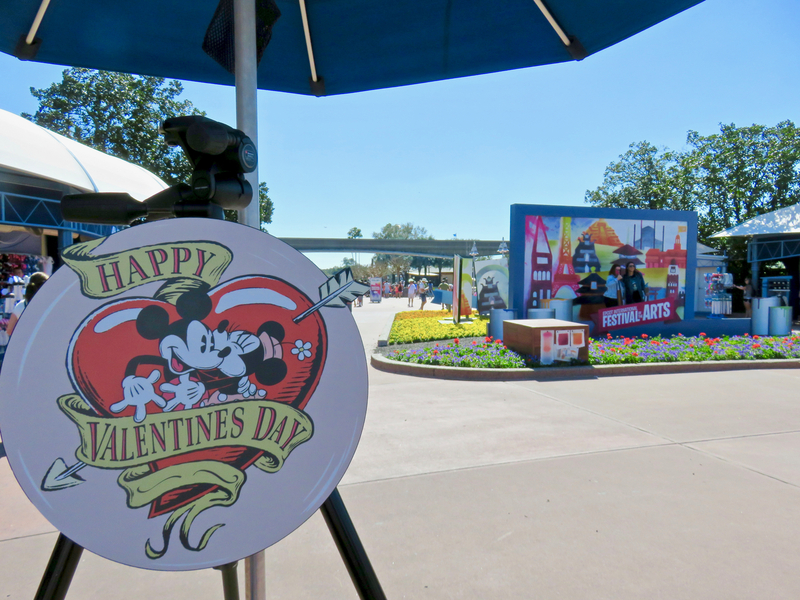 In addition to Disney PhotoPass signs you can hold while creating your photo memories, Cinderella's Coach is scheduled to be an available photo spot on Valentine's Day in Fantasyland at Magic Kingdom. Photo by Alan S. Dalinka. 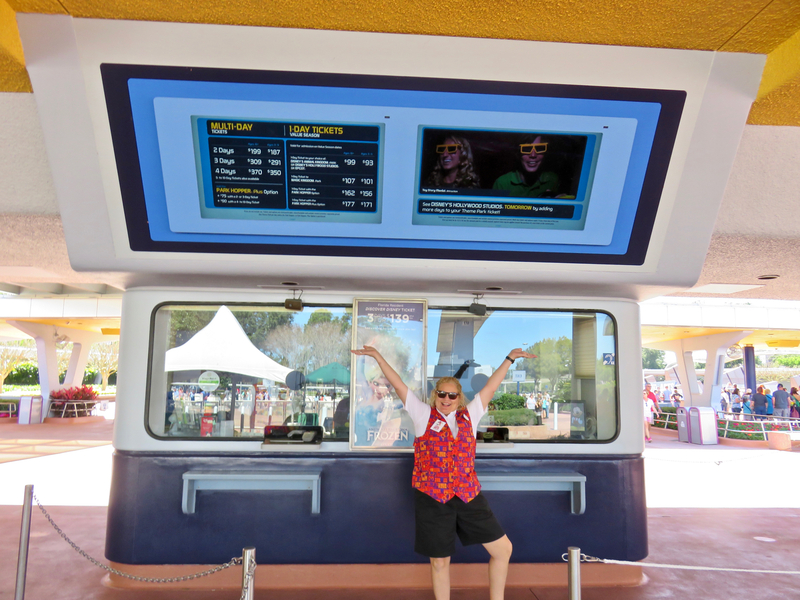 A cast member happily poses in front of one pair of Epcot Vacation Planning Booths (also known as ticket booths) where the monitors above the windows display some of the 2017 revised ticket prices and options. Photo by Alan S. Dalinka. Current ticket prices are displayed above ticket windows at Epcot and reflect the seasonal pricing in effect on the day of your visit. Photo by Alan S. Dalinka. 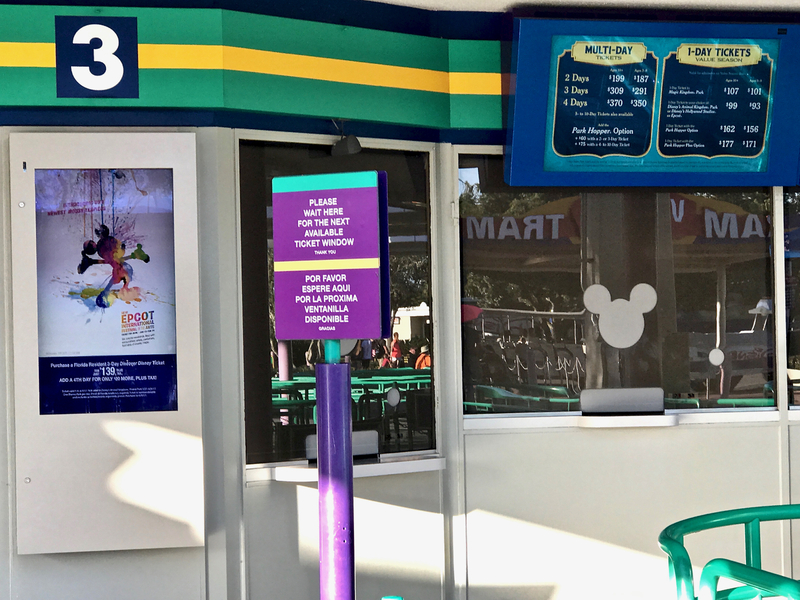 Walt Disney World Resorts' Park Tickets now not only must be completely used within 14 days of first use, that first day of use must be on or before December 31, 2018. In other words, you can no longer buy a ticket in 2017, and wait years or more before using it for admission. 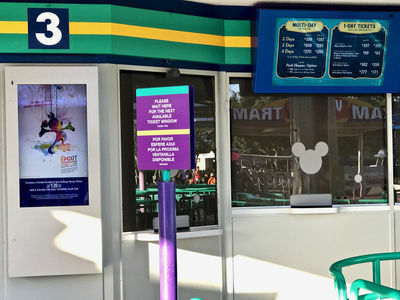 However, the purchase price of an unused, expired ticket can be applied towards the purchase of a new ticket at the then-current park ticket price. Unused, expired tickets cannot be returned. 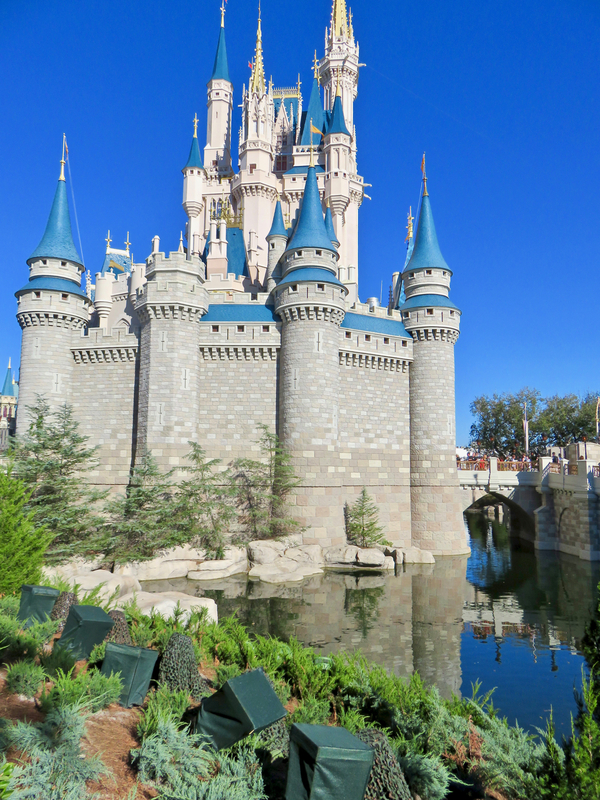 The $139 plus tax for 3-Days Florida Resident offer remains available this winter. Photo by Alan S. Dalinka. Two tickets actually went down every so-slightly in price: the two- and three-day, one-park tickets. 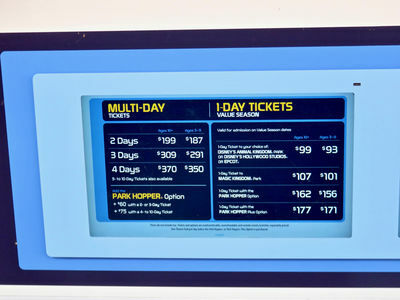 A few prices, including general parking ($20/car), and a one-day visit to Magic Kingdom during the Peak Season ($124 plus tax), did not change at all. Preferred theme park parking price has increased $5 per day. General parking remains unchanged ($20/car). Photo by Alan S. Dalinka. Again, please review MousePlanet's Walt Disney World Park Guide to see how the ticket options that relate to your plans have changed. This past Thursday, Disney Parks Blog finally announced the long-delayed official debut of Disney's Animal Kingdom's newest nighttime experience, Rivers of Light, will take place on February 17. We plan to bring you live coverage (should technology cooperate) some time before its scheduled 7:15 p.m. Eastern Standard Time start, so plan to keep an eye on our Facebook page and Twitter feeds for details. Shortly following that announcement, dinner packages including reserved seats for the show became available at Tiffins signature restaurant and at Tusker House. 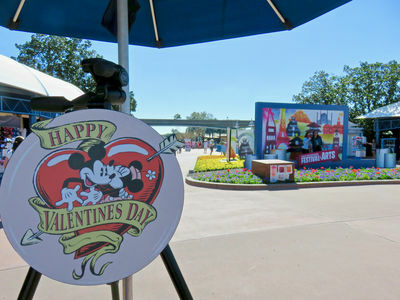 Be sure to check MyDisneyExperience.com or the My Disney Experience App for dining packages and Fastpass+ reservations. 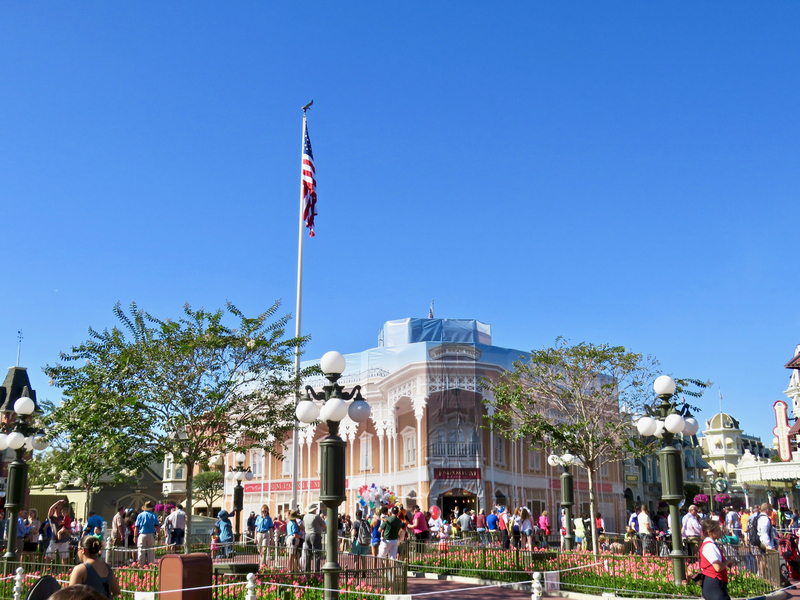 On Friday morning we learned that public preview performances (often referred to as a "soft opening") were set to begin that night and that Fastpass+ reservations were available. We can already provide you with an advanced look at the likely near-final version of the show and provide you with some initial impressions. Remember, of course, entertainment is subject to change (including its schedule), and even more so with a show before its official debut. Fastpass+ reservations are available (though likely scarce since the theater seats only 5,000 guests, some of which will be dinner package reservation holders. Photo by Alan S. Dalinka. The new 5,000 seat amphitheater along the Discovery River, which served as last summer's temporary home of The Jungle Book: Alive With Magic (when Rivers of Light proved unready for its debut), was designed specifically for this show. Walt Disney Imagineering describes the theater as forming two "villages" on the two separate embankments: "The Serka Zong Marketplace and the Discovery River shoreline." Because the amphitheater was custom-built for Rivers of Light and not The Jungle Book show, it is very likely that every seat is a good seat for this show. Certainly the seat I chose without any advanced knowledge of what to expect seemed to have an outstanding view of the entire performance. 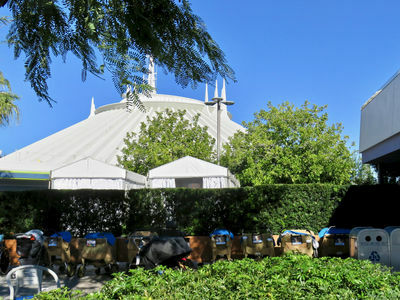 Before the formal beginning of the show, there is a pre-show as the floats move into their first performance positions; animal sounds and projections surround Discovery River. HDR Photo by Alan S. Dalinka. 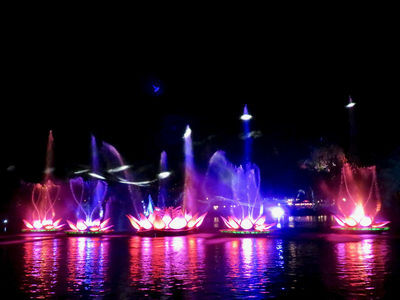 Several lotus-shaped floating fountains "dance" on the Discovery River during the show. Photo by Alan S. Dalinka. 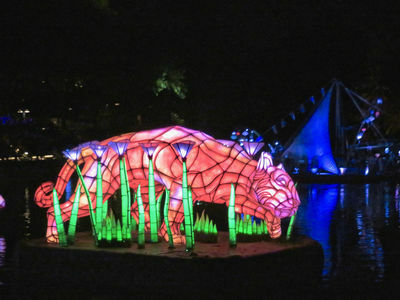 The show itself combines music, live performers, floating set pieces, water fountains, lasers, light and fire effects, mist screens, and more in "a celebration of animals and nature." The show takes place on the "stage" of the Discovery River, and begins with a pre-show where some of the floats move into place while animal sounds and projections surround the theater. 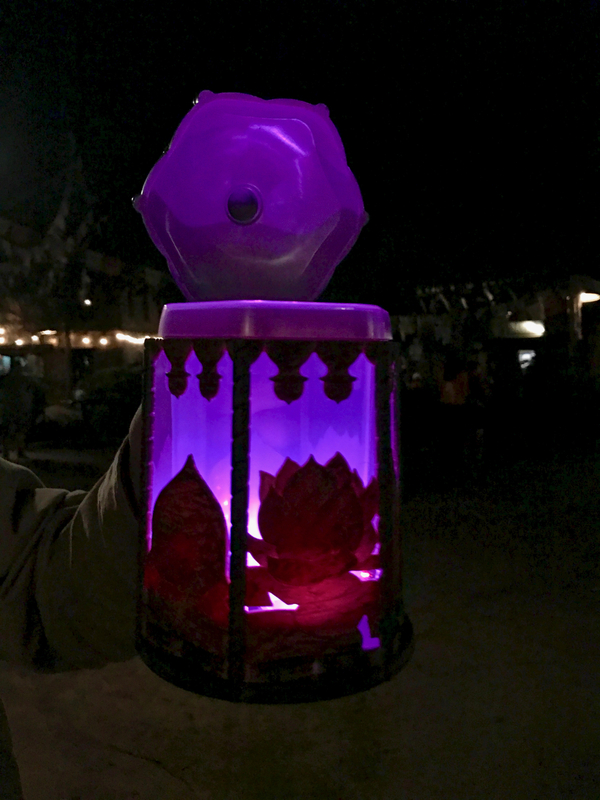 The show is intended to convey "the uplifting spirit of an ancient and timeless lantern ceremony—filled with symbolism, storytelling, and plenty of heart." The largest mist screens much more effectively display projected imagery in Rivers of Light than they did during "The Jungle Book" show last summer. Photo by Alan S. Dalinka. The show's story telling is left mostly to the imaginations of the viewers without a significant amount of narration. 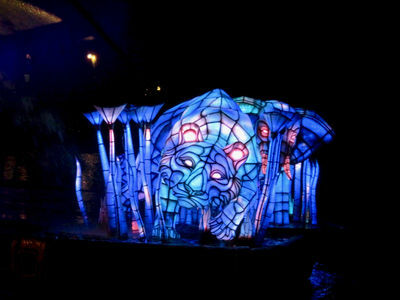 The most impressive floats are the "ancient lantern festival" floats that represent "four Animal Spirit Guides—an elephant, owl, tiger, and turtle." 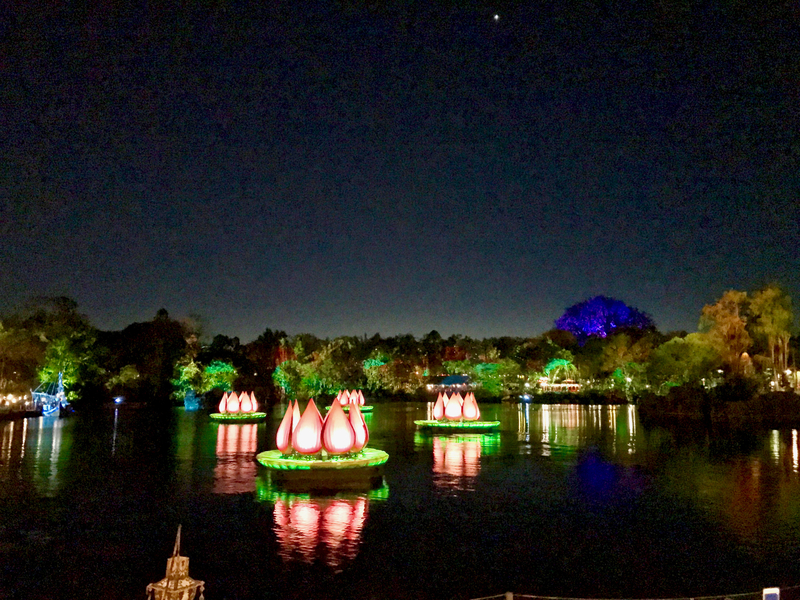 The largest of the lantern floats are 15-feet-tall and 30-feet-long, but are designed to look as if they were created centuries ago. 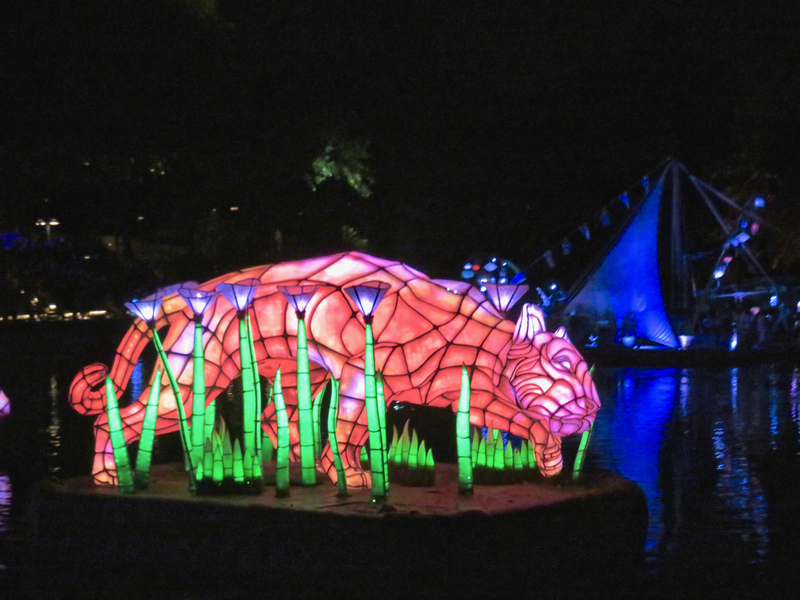 LED technology is used to illuminate the animals from within, changing colors and movement as the show progresses. The Tiger Animal Spirit Guide lantern float was one of the largest in the show. Photo by Alan S. Dalinka. 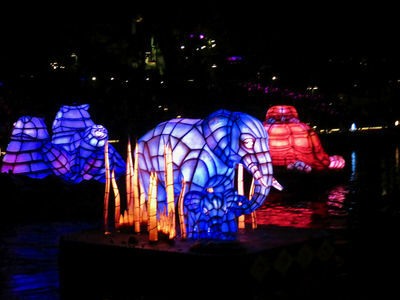 The Elephant Animal Spirit Guide lantern float includes a calf. Photo by Alan S. Dalinka. 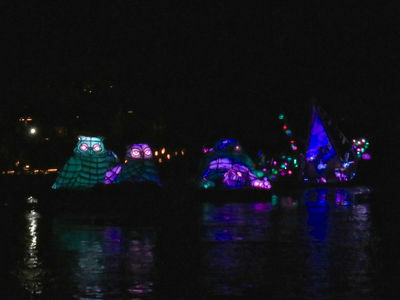 The Owl Animal Spirit Guide lantern float includes several owls. 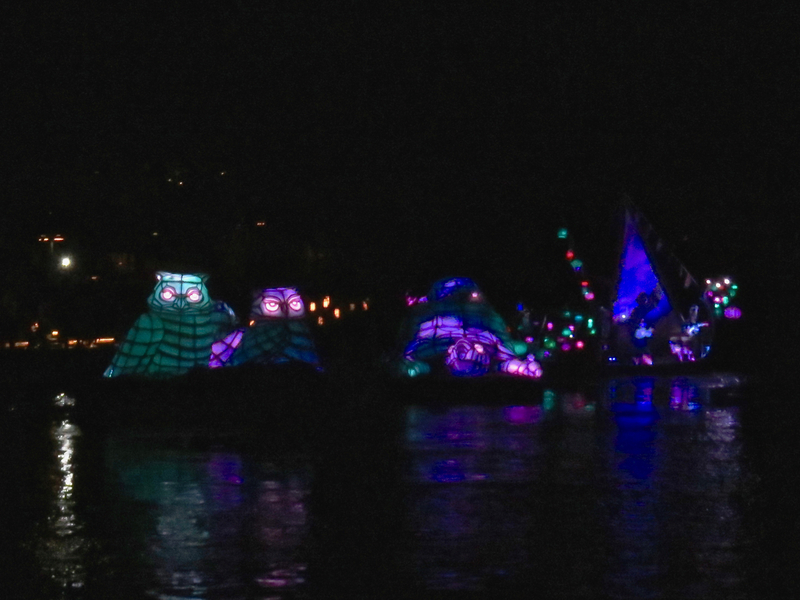 The Turtle Animal Spirit Guide lantern float is nearby. Photo by Alan S. Dalinka. 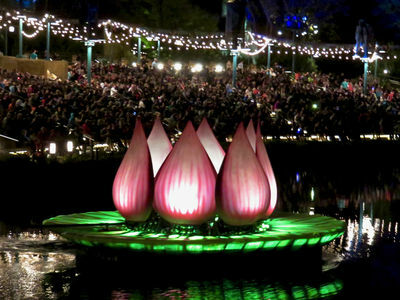 The lotus floats open to reveal fountains during the show. Photo by Alan S. Dalinka. 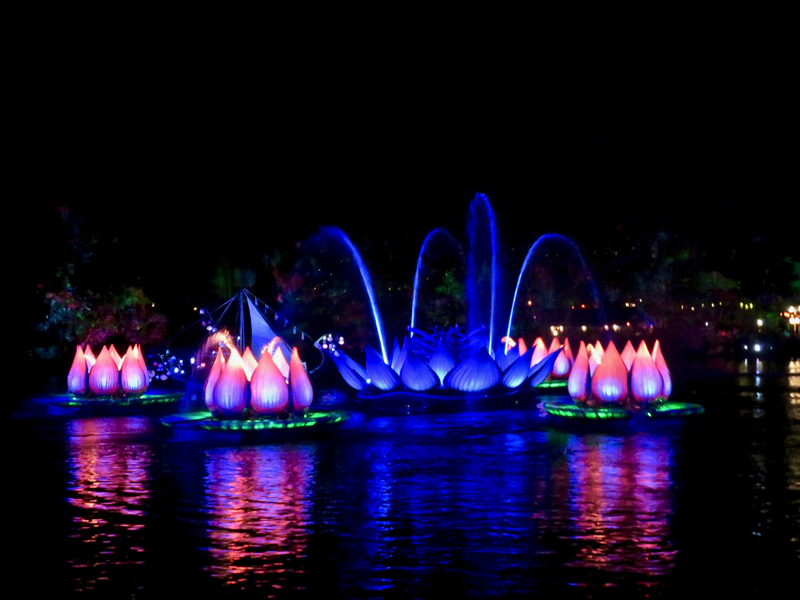 A larger central lotus float also includes fountains. Photo by Alan S. Dalinka. 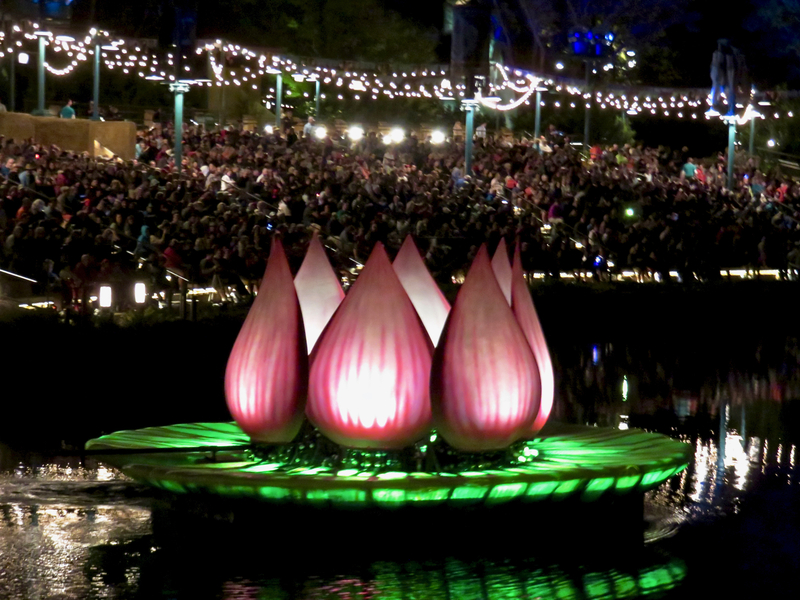 The mist of the floating lotus floats is used as a projection surface during the show. Photo by Alan S. Dalinka. 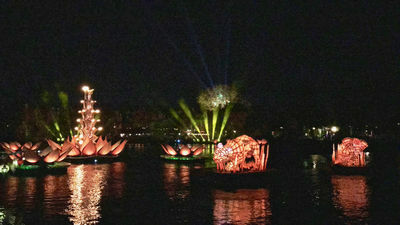 Live performers aboard two Asian junk-style boats participate in the "celebration" of animals and nature. Photo by Alan S. Dalinka. The finale of the show includes fire effects rising from the central lotus fountain float (but the show includes no fireworks or explosions). Photo by Alan S. Dalinka. 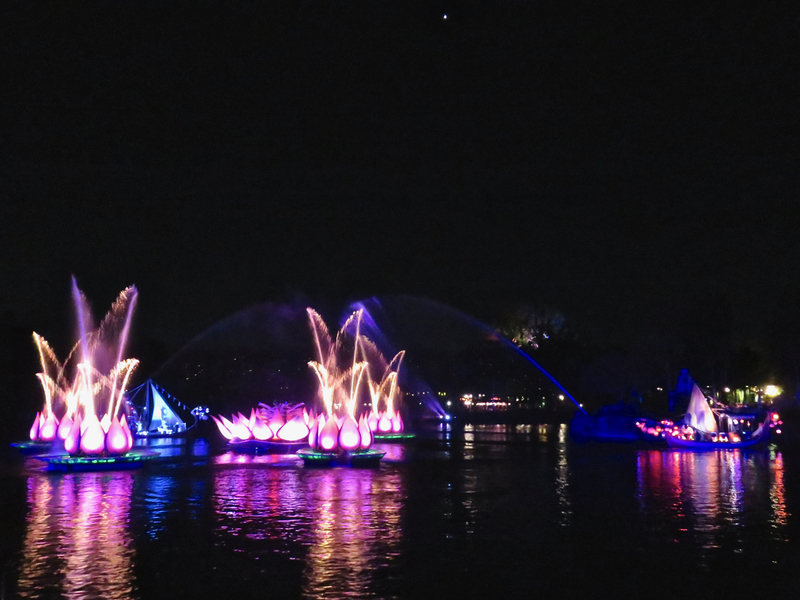 Rivers of Light is not a "nighttime spectacular" in the sense of a fireworks-type show that ends with a bang. Even the exit music is the more subtle atmospheric-type music that plays around Disney's Animal Kingdom. Having said that, I found the show to be visually stunning and the technology very impressive despite the numerous reports of glitches during cast previews and earlier rehearsals. 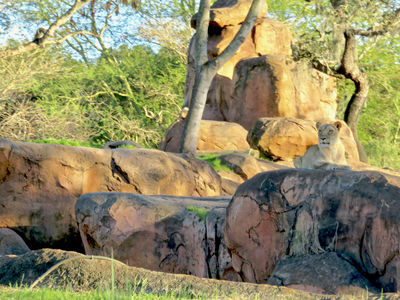 Like much of the beauty of Disney's Animal Kingdom, the best parts of this show are subtly impressive rather than overwhelmingly so. I enjoyed it quite a bit and look forward to seeing its official debut later this week. 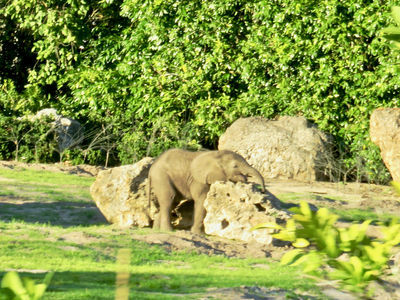 I think it fits the overall theme of Disney's Animal Kingdom quite well. 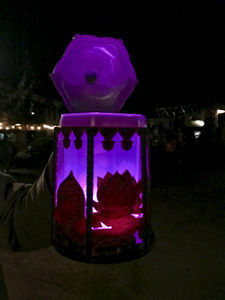 The lantern floats linger on Discovery River after the conclusion of the show; unlike most of Disney Parks' nighttime "spectaculars," RIvers of Light is accompanied by atmospheric-type music rather than a specific "exit music" theme (like Wishes, Fantasmic! and Illuminations: Reflections of Earth). Photo by Alan S. Dalinka. 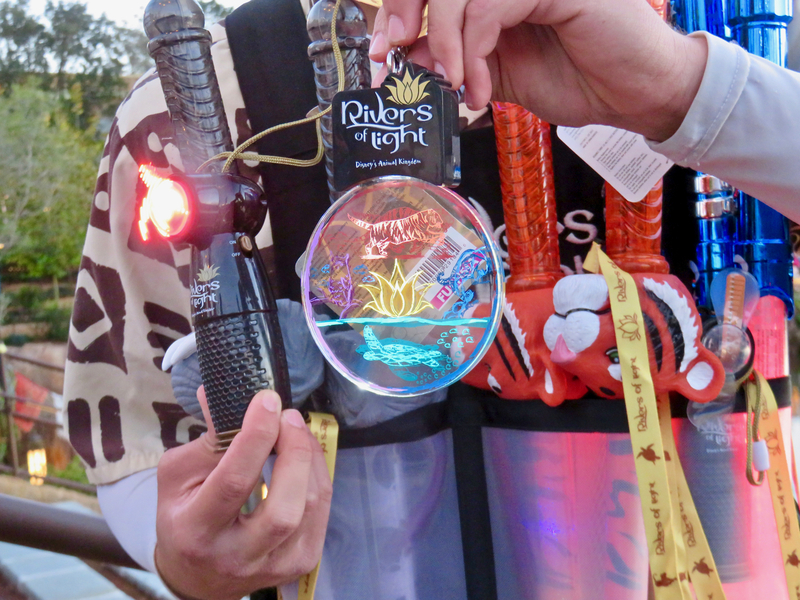 Cast members sell some of the lighted merchandise in the aisles before the show begins; the fan and pendant shown here are each $16. 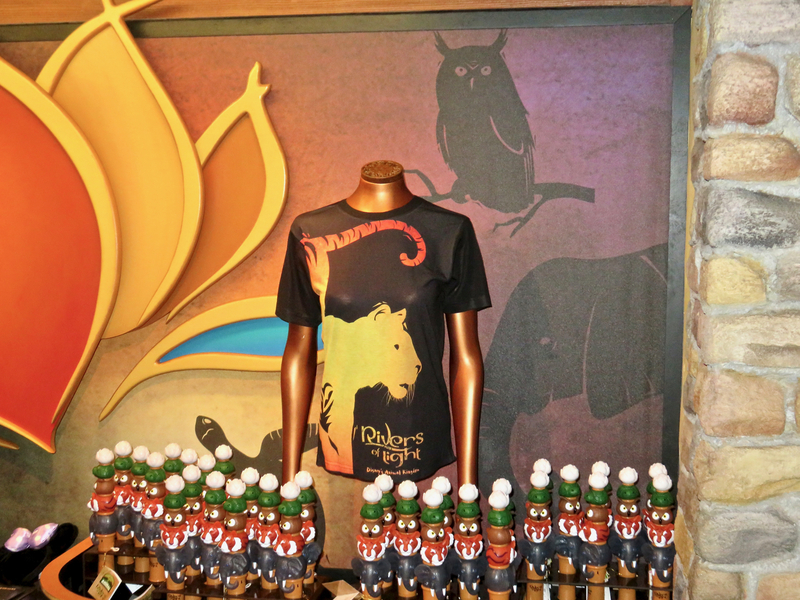 More merchandise photos are included in the "Views Around the World" section of the Update. Photo by Alan S. Dalinka. 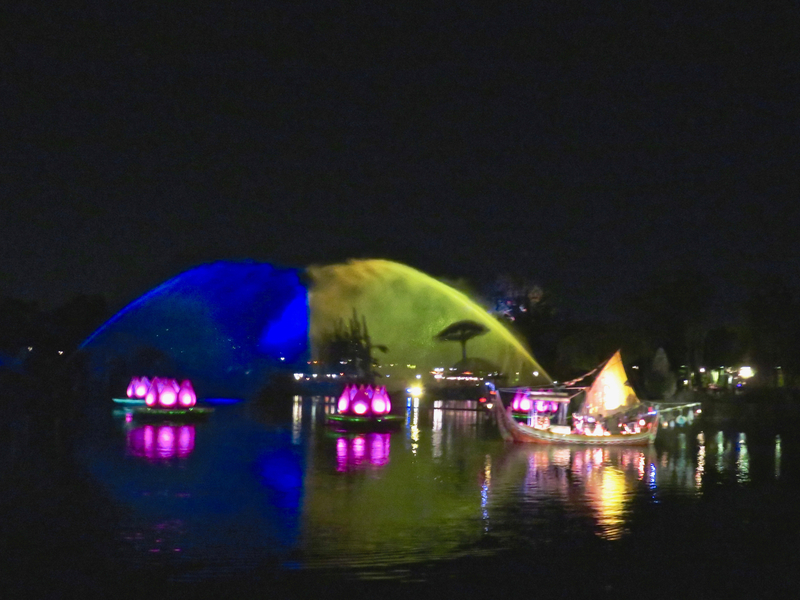 Rivers of Light runs for fifteen minutes, not including its pre- or post-show projections or floats. As of this Update, it is scheduled on only select nights and, on those nights, only once per night. 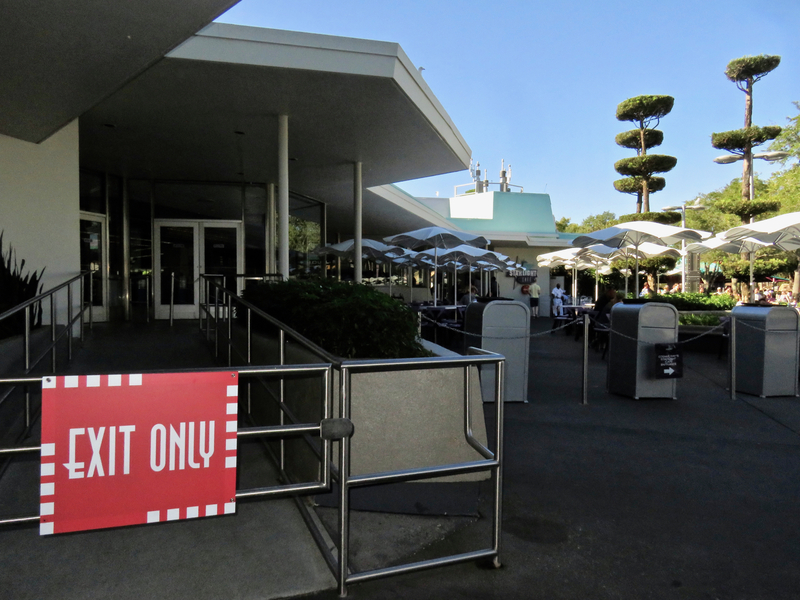 Except for Dining Packages (and souvenirs), admission is included with your park ticket. It has been nearly fourteen years since Magic Kingdom introduced a new nightly fireworks show. Now that show, Wishes: A Magical Gathering of Disney Dreams, will launch its final fireworks on May 11, 2017. 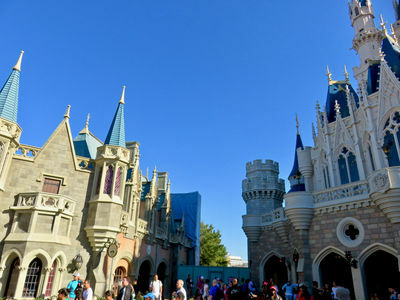 Its replacement, Happily Ever After, debuts on May 12, and will make extensive use of the same sort of state-of-the-art projection mapping technology used in the Once Upon A Time Cinderella Castle projection shows (which are also scheduled to continue). 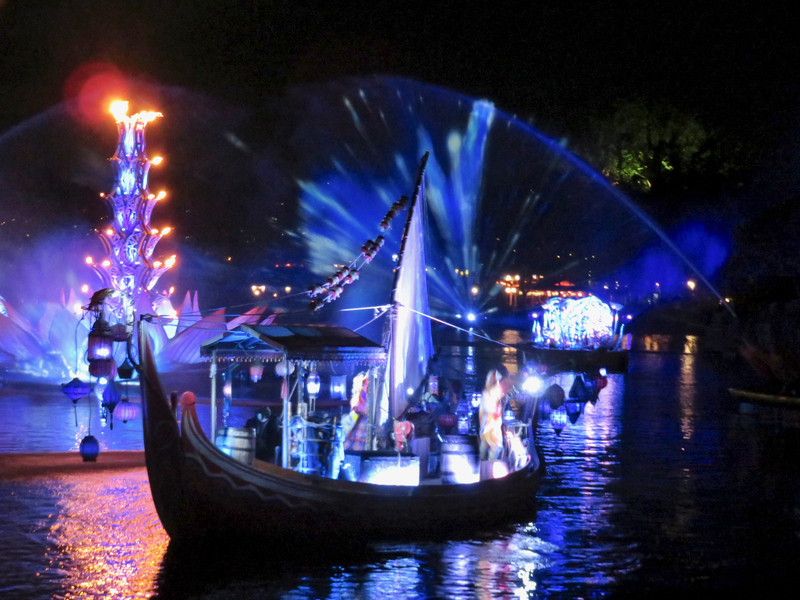 Happily Ever After, a new nighttime spectacular. 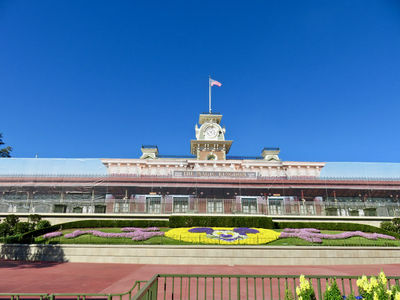 will debut at Magic Kingdom on May 12. Video ©Disney. The show will feature a new original score and, according to Disney Parks Blog, "more Disney characters than ever before...including moments from Moana, Brave, Big Hero 6, Zootopia, The Princess & The Frog, Aladdin, and many others." 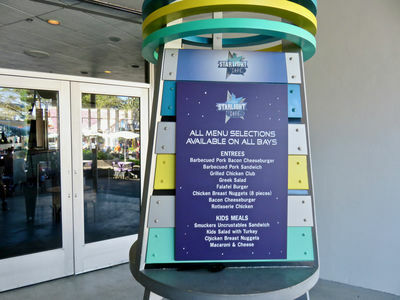 The dessert and fireworks viewing party at Tomorrowland Terrace will continue to be offered when the new show makes its debut. Near the west pathway between Liberty Square and Fantasyland, there are several apparently new pieces of equipment that may be necessary for the new show. Photo by Alan S. Dalinka. Several pieces of technology that may be used for the new show flank Cinderella Castle to the west; the pathway on the east is currently closed to guests. Photo by Alan S. Dalinka. While Wishes replaced the then 32-year old Fantasy in the Sky fireworks show in 2003, even the Fantasy in the Sky show never completely disappeared from Magic Kingdom. Several versions of it have continued to be presented over the years, for example, as recently as the lead-up to the countdown to the New Year on December 30 and 31, 2016. 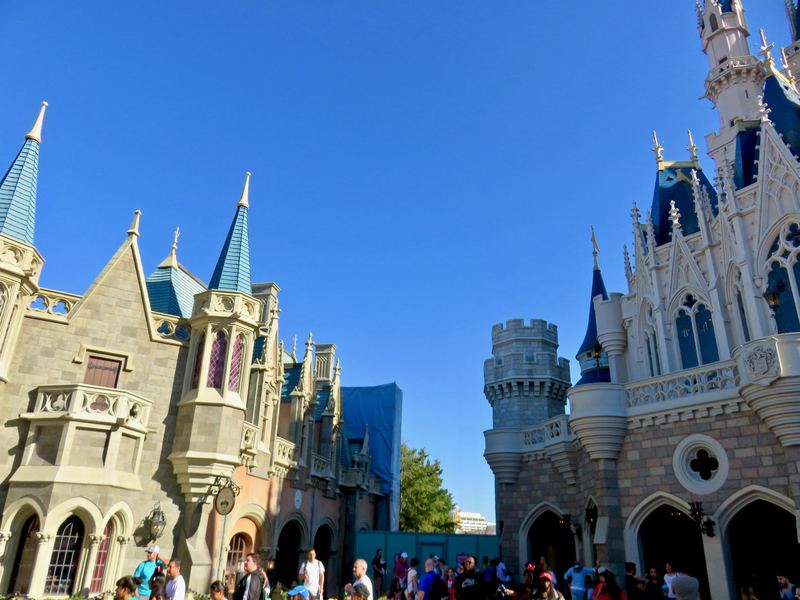 So far, we have not seen any announcements regarding changes to the Happy HalloWishes or Holiday Wishes shows. Just hours after our Update was published last week, Disney CEO Bob Iger used the Walt Disney Company's First Quarter 2017 earnings call to announce that Pandora – The World of Avatar officially will open on May 27 at Disney's Animal Kingdom. Pandora replaces the original Camp Minnie-Mickey area of the park that closed back in January 2014. 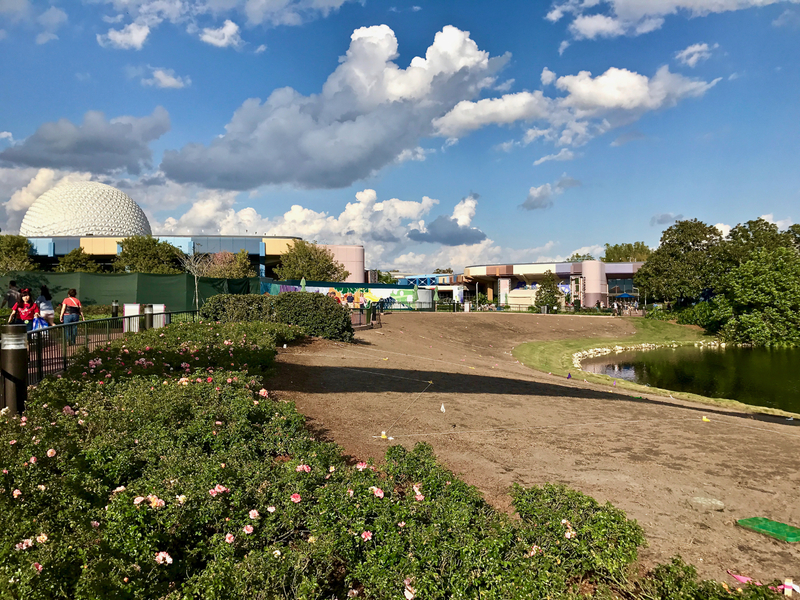 We have regularly shared photos of the publicly-viewable areas of construction in our weekly Updates, and unless there are some unannounced previews (a "soft opening"), we may not see too many new views before then. AVATAR creators James Cameron and Jon Landau (as Alpha Centauri Expeditions Founder Marshall Lamm) and Imagineer Joe Rohde discussed the future land at Disney's Animal Kingdom of Pandora – The World of AVATAR as though Pandora is a real place, the movie of several years ago was a documentary (and that the bad people portrayed in the movie are all gone), and that Disney's Animal Kingdom provides a "gateway" to visiting this far-off planet. 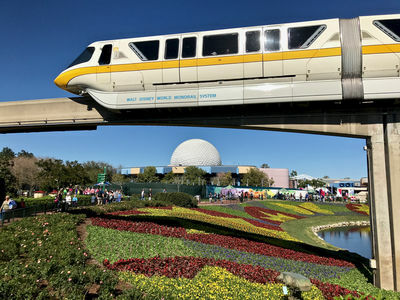 The message that they sought to convey seemed to be that this new land will represent the foremost in "placemaking," where even the physics and biology of the land make sense in terms of the story being told. They used numerous real and created scientific terms to explain the various effects guests will experience in the land, such as floating mountains and bioluminescent plants that create a "dreamlike" environment. My scientific education (and science fiction acumen) is not deep enough to attempt to spell most of the terms they used in their description; hopefully when the land opens next summer, we will all be able to understand the story on the same level its creators intend. As we have already seen, Pandora features "floating" mountains, and we expect an abundance of "bioluminescent plants." The native people of Pandora, the Na'vi, will welcome guests on two excursions (rides): the family friendly Na'vi River Journey through a bioluminescent rainforest and encounter with a Na'vi Shaman, and the reportedly E-Ticket Avatar Flight of Passage to explore Pandora atop a banshee. Guests will also be able to dine at Satu'li Canteen, grab a drink at Pongu Pongu, or shop for Na'vi cultural items, toys, science kits, and more at Windtraders. Bob Iger used the same Quarterly Earnings Call to announce that the Star Wars lands under construction within Disney's Hollywood Studios at Walt Disney World and within Disneyland in California will be ready to open in 2019. 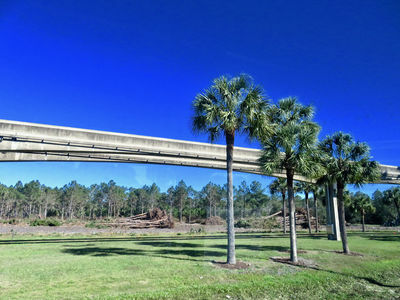 The lands are billed as "the largest-ever, single-themed land expansions at Disneyland and Walt Disney World Resorts," so, presumably, even bigger than the soon-to-open Pandora. So far, here in Florida, our main view of the construction project has been the demolition of Streets of America; Lights, Motors, Action! ; and Catastrophe Canyon, as well as construction cranes. We will keep you posted on this project in the coming years. 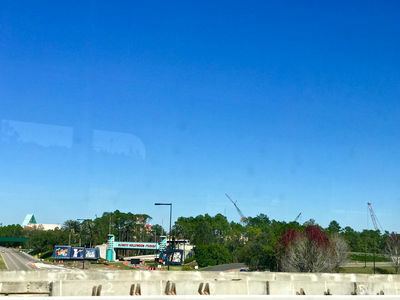 From a Disney transport bus outside Disney's Hollywood Studios on Osceola Parkway, it is possible to see signs of construction. Photo by Alan S. Dalinka. At Muppets Couryard, the construction cranes that tower in the distance are likely assisting in the construction of the new Star Wars land. Photo by Alan S. Dalinka. On a weeknight, the sky above Epcot took on the look of the Epcot International Festival of Arts color scheme, complete with a full rainbow at sunset. Panoramic Photo by Alan S. Dalinka. With the lengthening of Epcot's decades-old Festivals (Food & Wine in the Fall and Flower & Garden in the Spring); the increasing December presence of the Holidays Around the World (and its new food kiosks); and this year's creation of the all new Epcot International Festival of the Arts, except for the busy summer months, it is now very rare that Epcot is not celebrating a festival. 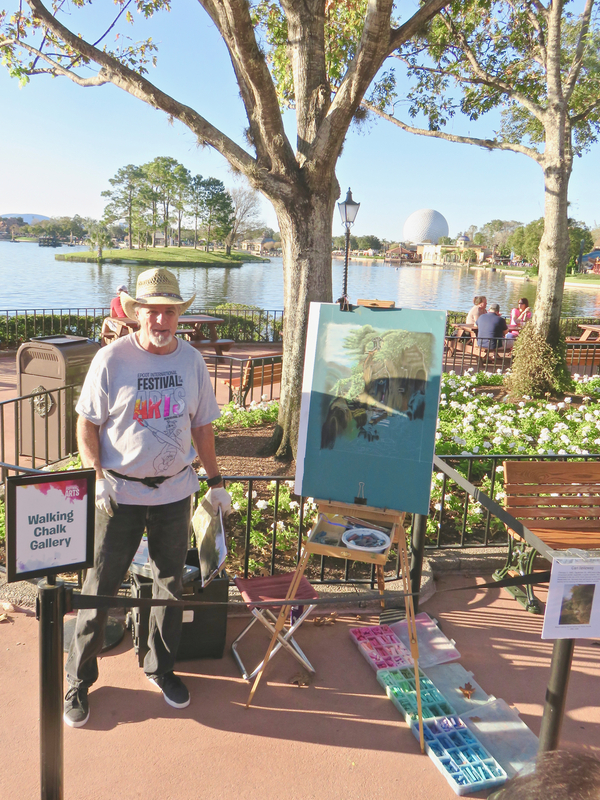 Nevertheless, such will be the case for a very brief time starting next Tuesday, February 21, and continuing through February 28, as the park winds up the apparently very successful Festival of the Arts and begins its next Flower & Garden Festival. Even as the Festival of the Arts entered its penultimate weekend last Friday and continues to its finality, the park's transformation for Flower & Garden Festival is already in full swing. I took the opportunity this week to revisit some of the artists I visited on the Festival's opening weekend. 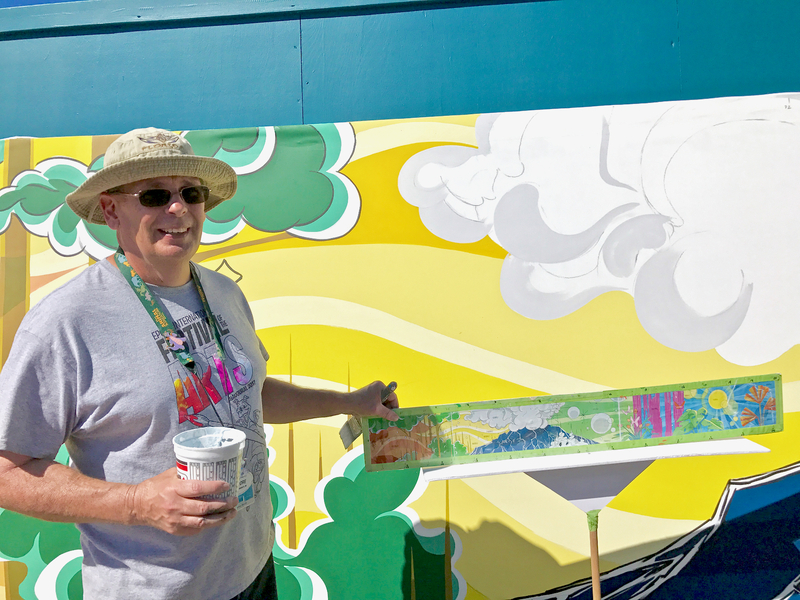 Disney artist Brian T. Brimmer Sr. shows off what the final Future World West mural will look like by the end of the Festival of the Arts. Photo by Alan S. Dalinka. Walking chalk gallery artist Ron Hawkins shows off some of his work at the Festival of the Arts. For the final weekend of the Festival, he will make appearances outside the American Adventure. Photo by Alan S. Dalinka. 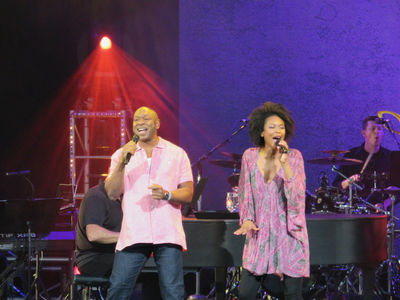 Disney on Broadway Concert Series performers Alton Fitzgerald White and Kissy Simmons perform during the final two weekends of the Festival. Photo by Alan S. Dalinka. The final Disney on Broadway Concerts featuring Kissy Simmons and Alton Fitzgerald White (both of whom performed long runs in Disney's "The Lion King") are scheduled February 17-20 at America Gardens Theatre. Video by Alan S. Dalinka. 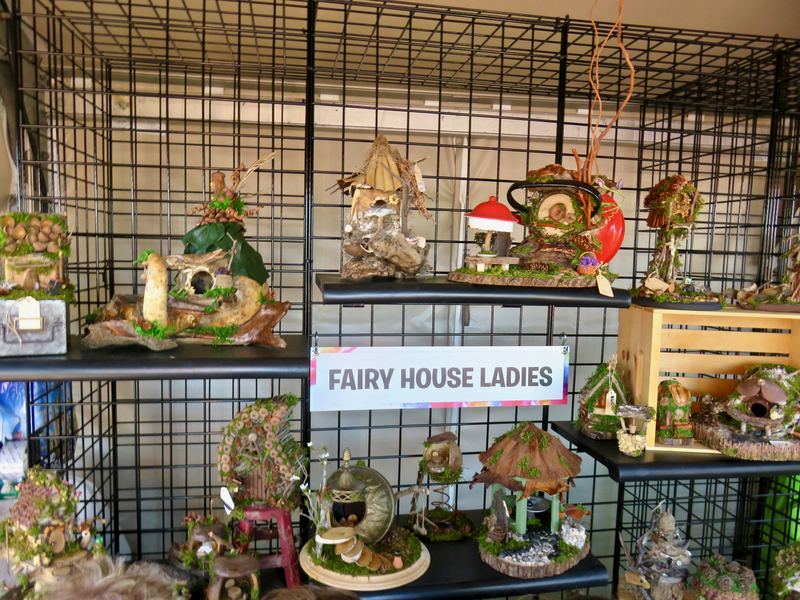 The Fairy House Ladies have enjoyed participating in the first ever Epcot International Festival of the Arts. Photo by Alan S. Dalinka. Shirley, Michael, Vicki, and Ronda (The Fairy House Ladies) are scheduled to return to Epcot for select dates in the Festival Center (the former Wonders of Life Pavilion) during the Epcot international Flower & Garden Festival as well. Photo by Alan S. Dalinka. 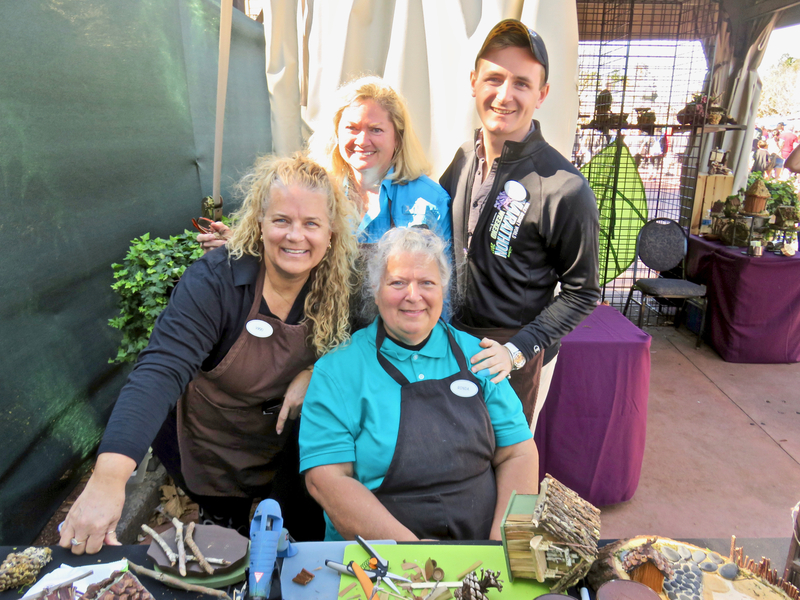 Disney's Tables in Wonderland is hosting a preview buffet lunch inspired by this year's Epcot International Flower & Garden Festival, and includes items from this year's "outdoor kitchens," along with featured wine and beer pairings. The lunch will be held at World ShowPlace Pavilion, this Sunday, February 19, 2017 from 12:00 p.m. to 2:30 p.m. The price is $145 per person, with registration on a first-come, first served basis on the Tables In Wonderland website. Even if you are unable to attend the Tables in Wonderland preview buffet, you can get a look at some of the food coming to this year's 90-day festival on the Disney Parks Blog. Last week there was a lawn here in Future World West. Photo by Alan S. Dalinka. 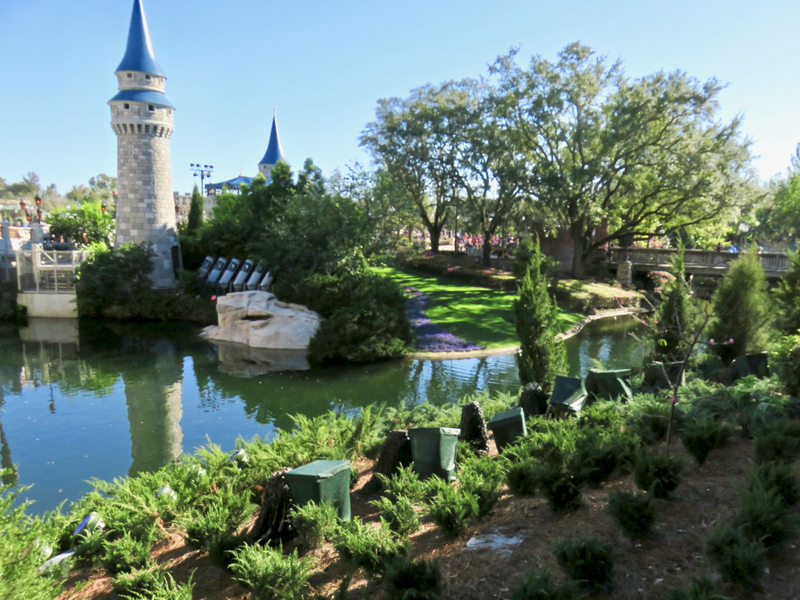 By the middle of this past week, Flower & Garden Festival flowers were in place in Future World West; we expect Future World East will receive its flowers soon. Photo by Alan S. Dalinka. 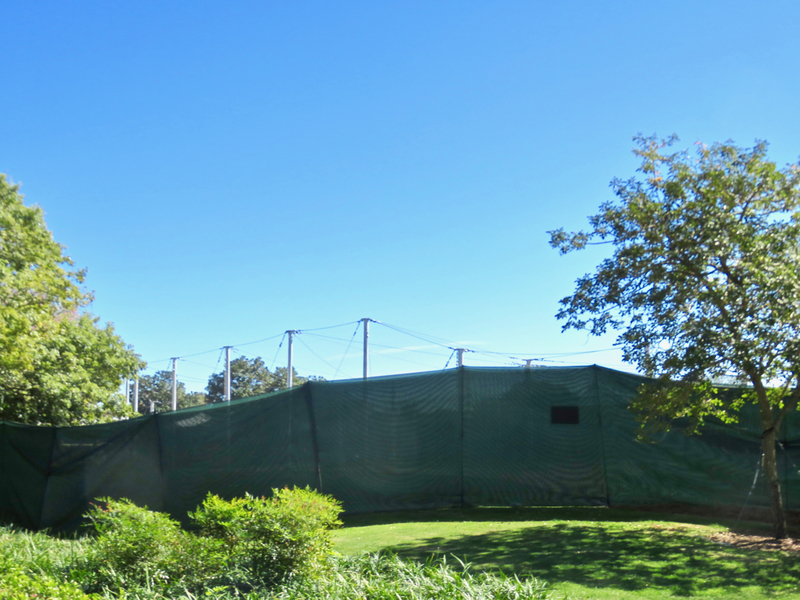 The butterfly house is under construction in the same spot as last year in Future World West. Photo by Alan S. Dalinka. 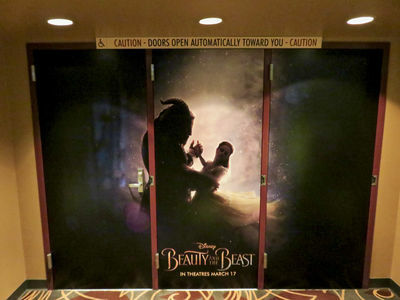 On February 10, the Walt Disney Theater inside One Man's Dream at Disney's Hollywood Studios began showing nine-minute previews of Disney's new live action version of Beauty and the Beast, which opens in U.S. Theaters on March 17. The area immediately outside the theater now includes a dress and props from the making of the movie, along with additional new pieces from Star Wars and Pixar films, The Lion King on Broadway, and The Descendants TV series. Inside One Man's Dream is where you can see the new Disney's "Beauty and the Beast" preview. Photo by Alan S. Dalinka. The Walt Disney Theater inside One Man's Dream now shows a nine-minute preview of the upcoming movie. Photo by Alan S. Dalinka. 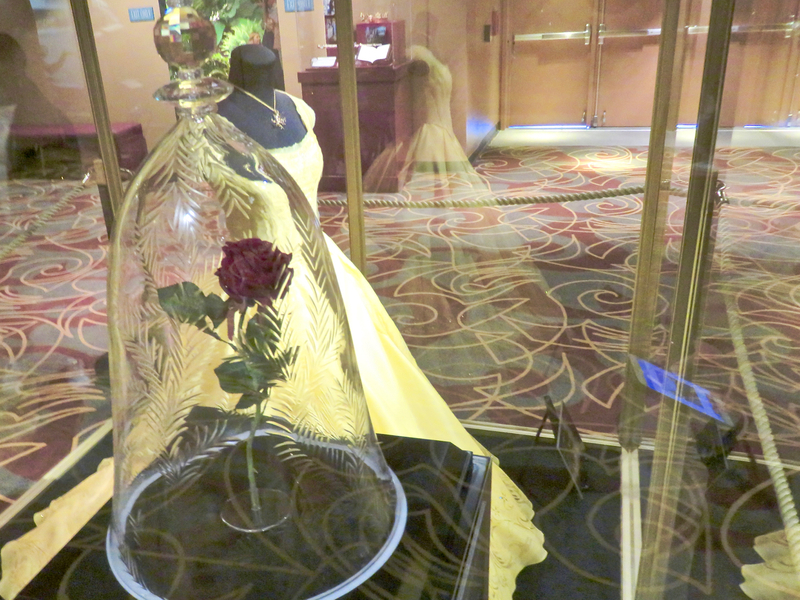 The iconic rose and one of Belle's formal dresses from the upcoming movie are now on display outside the theater. Photo by Alan S. Dalinka. 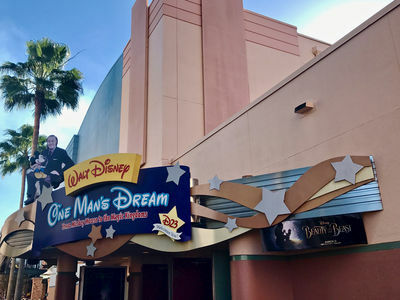 New Star Wars and "The Lion King" on Broadway props and costumes have been added to One Man's Dream as well. Photo by Alan S. Dalinka. 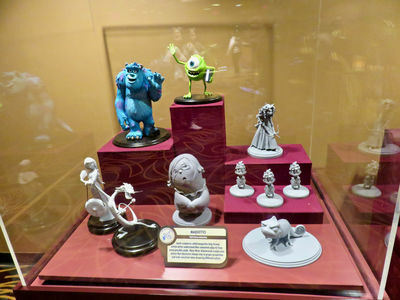 Disney-Pixar maquettes are now on display at One Man's Dream. Photo by Alan S. Dalinka. 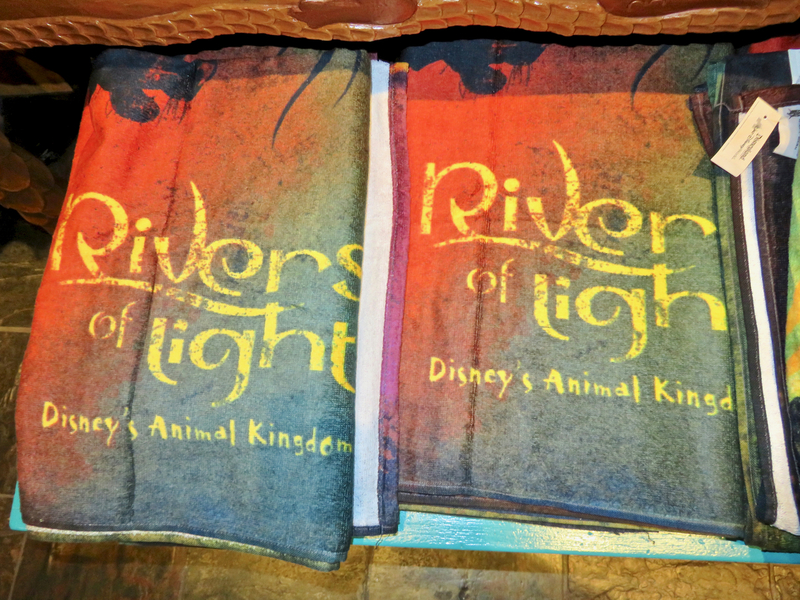 Even with all the news and photos we shared so far, there are more things to see around Walt Disney World, including more Rivers of Light merchandise at Disney's Animal Kingdom. 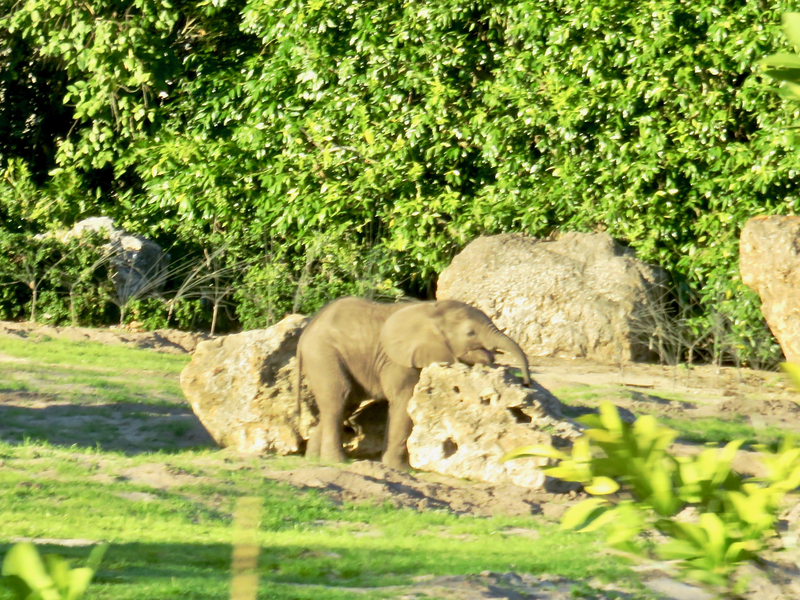 The female elephant calf, Stella, at Kilimanjaro Safaris was playing among the rocks during my recent ride. Photo by Alan S. Dalinka. A female lion keeps a watchful eye on several animals (not shown) that were running past the other side of my safari vehicle. Photo by Alan S. Dalinka. 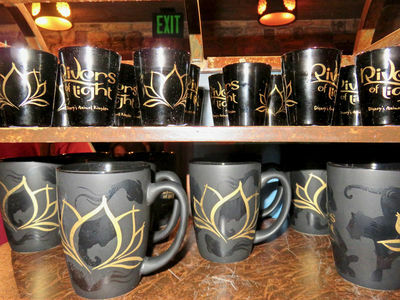 Several attendees of the first public preview Rivers of Light show had themed lighted beverage mugs that they said were being sold at popcorn carts, though I did not see any being sold despite searching after the show. Photo by Alan S. Dalinka. Discovery Traders near the bridge from Discovery Island toward the park's exit is where most of the Rivers of Light souvenirs were being sold on the night of the first public preview show. Photo by Alan S. Dalinka. 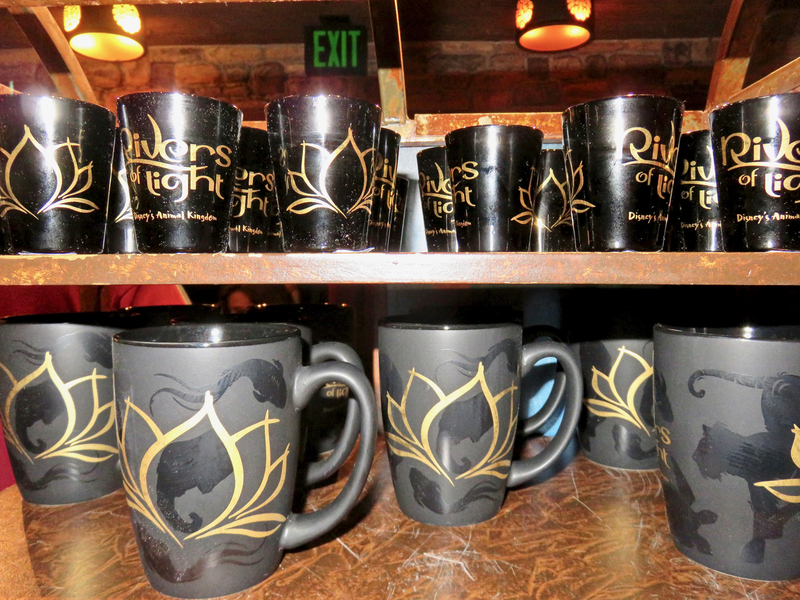 The stylized Rivers of Light logo and lotus designs appear on much of the new merchandise. Photo by Alan S. Dalinka. These Rivers of Light themed "throw" blankets seemed popular, notwithstanding this winter's warm weather. Photo by Alan S. Dalinka. 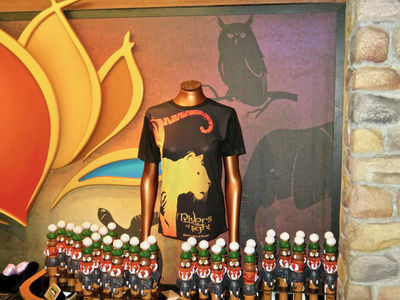 Several of the items available for sale in the Rivers of Light Amphitheater were also available for sale at Discovery Traders. Photo by Alan S. Dalinka. 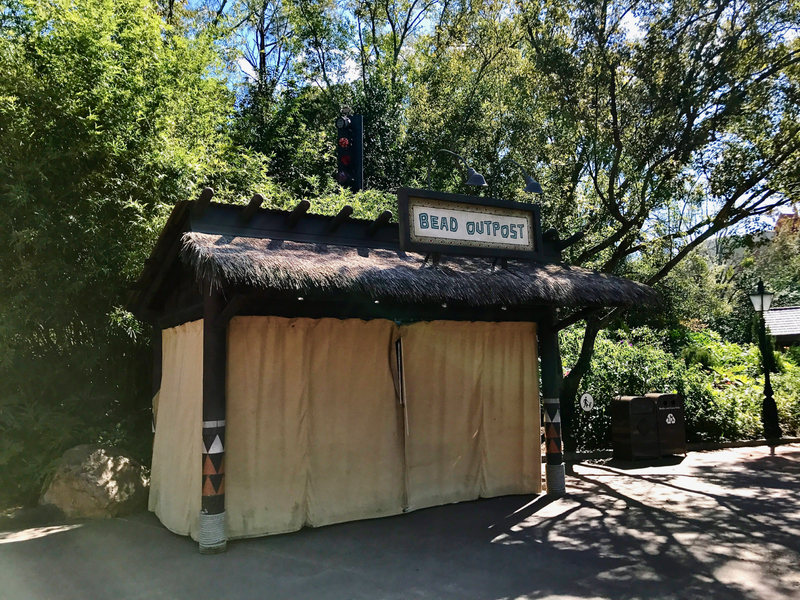 The Beads Outpost at the African Outpost in World Showcase was closed all week; nearby cast members say it is permanently closed. Photo by Alan S. Dalinka. 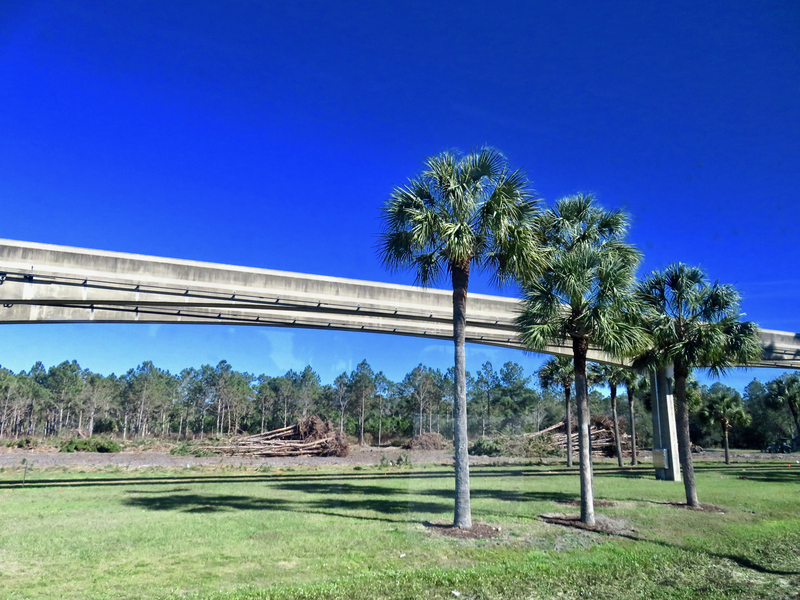 As the roadwork around Magic Kingdom's toll plaza continues, a large number of trees are being removed east of the Epcot monorail beam that runs alongside of World Drive. Photo by Alan S. Dalinka. The construction scrim at Main Street Station now includes a depiction of the station. Photo by Alan S. Dalinka. 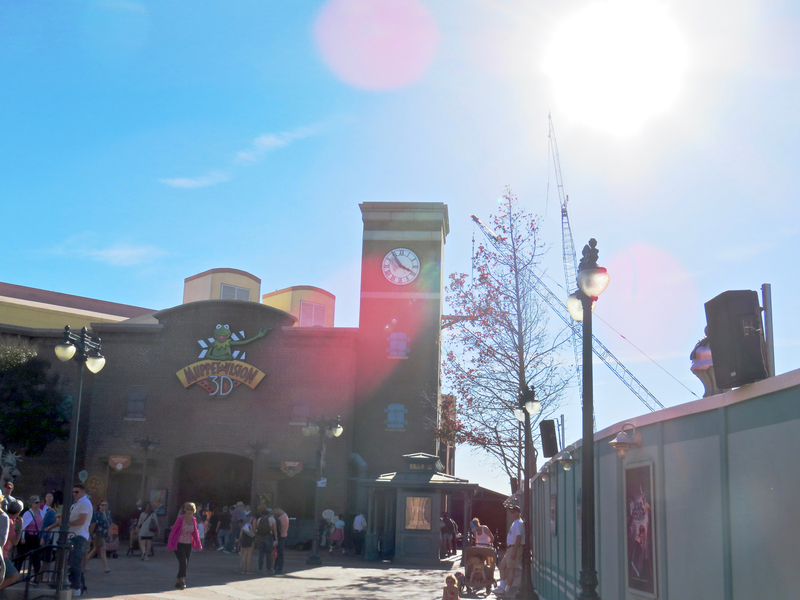 The Main Street Emporium's construction scrim likewise now looks like the exterior of the Emporium. Photo by Alan S. Dalinka. 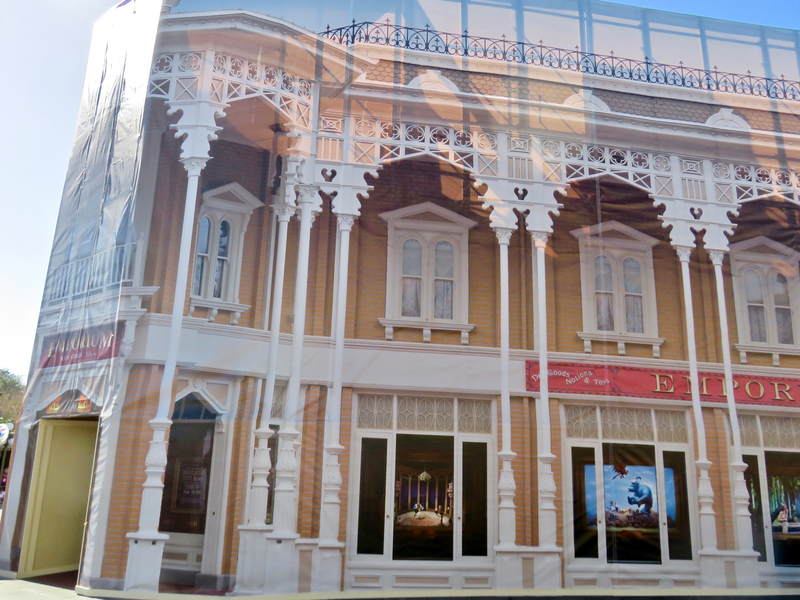 The detail of the Emporium's construction scrim includes a reproduction of the store's animated windows. Photo by Alan S. Dalinka. 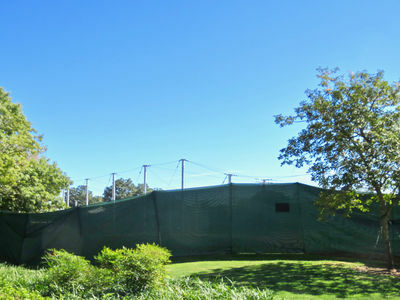 The mystery hole a few weeks ago is now a new round kiosk-style building. Some have speculated that it may be a new Joffrey's Coffee location. Photo by Alan S. Dalinka. Magic Kingdom cabanas are still standing and available for rent. Some are questioning whether they will remain. Photo by Alan S. Dalinka. 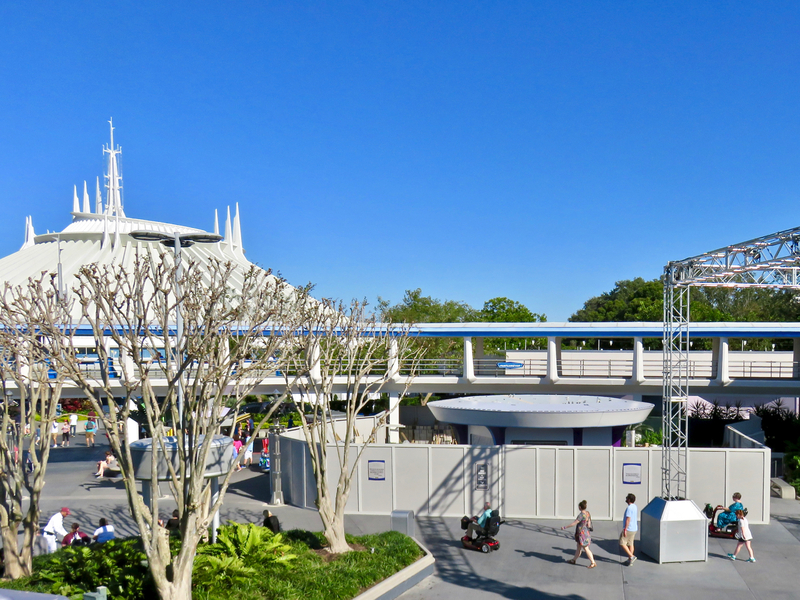 Enjoy a ride aboard the Tomorrowland Transit Authority PeopleMover from Space Mountain back to Rocket Tower Plaza. Video by Alan S. Dalinka. As Starlight Cafe's renovations continue, changes are being made to traffic flow into and out of the quick service restaurant. Photo by Alan S. Dalinka. 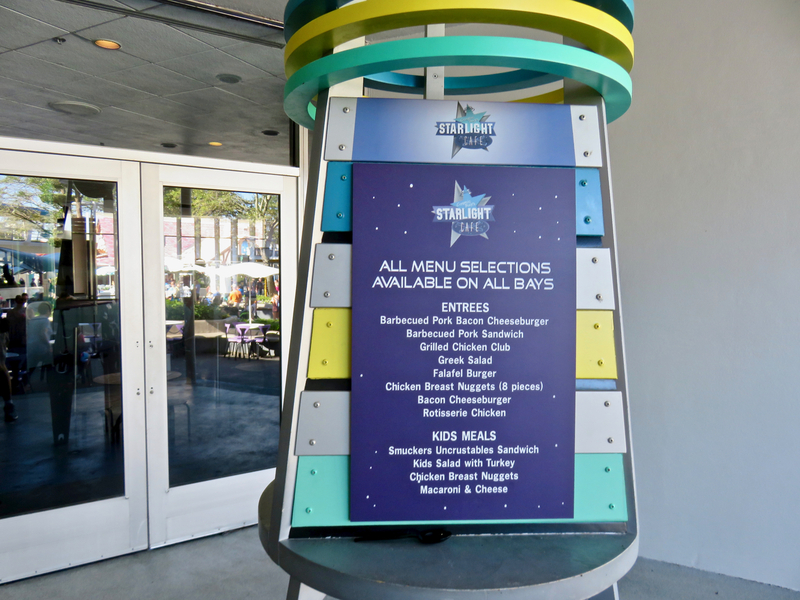 The Starlight Cafe menu is now available in all open bays inside. Photo by Alan S. Dalinka. 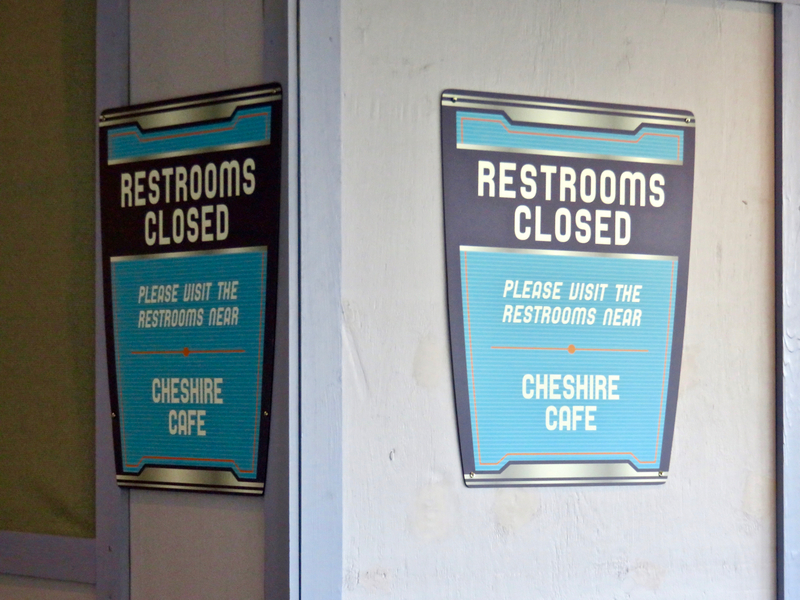 Starlight Cafe's restrooms closed for refurbishment. Photo by Alan S. Dalinka. Much earlier than last year, the construction crane that assists in removal of the holiday "dream lights" is no longer behind Cinderella Castle. The connecting pathway to Fantasyland's east side and Tomorrowland remains closed. Photo by Alan S. Dalinka. 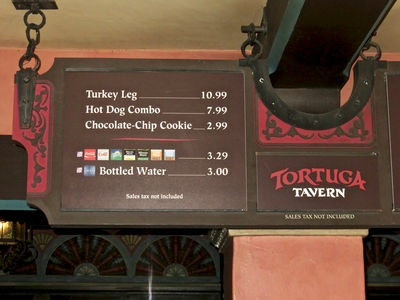 The ever-popular turkey leg cart in Frontierland was closed this weekend. Photo by Alan S. Dalinka. But, never fear turkey legs-lovers, they are now available at Tortuga Tavern in nearby Adventureland. Photo by Alan S. Dalinka. 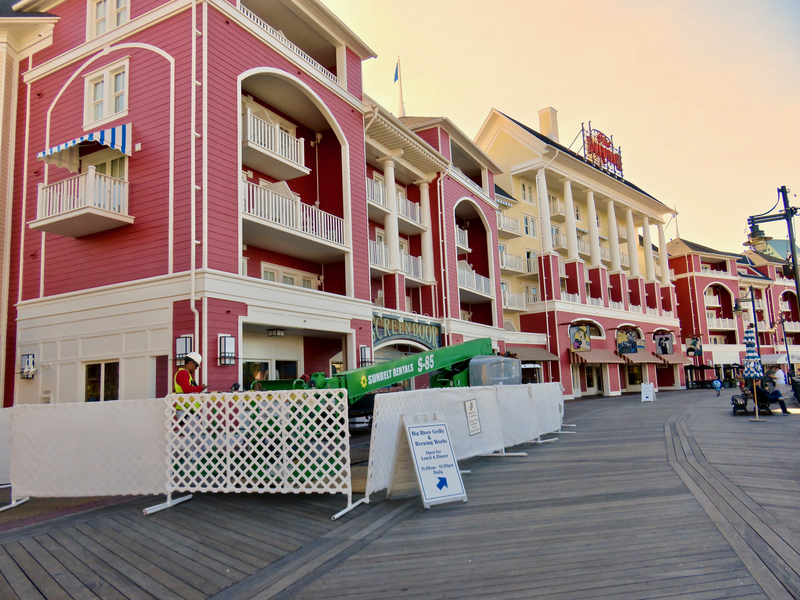 Minor refurbishment is underway along Disney's BoardWalk. Photo by Alan S. Dalinka. As I introduced a few weeks ago, this section of the Update provides our MousePlanet readers with the benefit of my years of experience as a longtime Walt Disney World Four Parks Annual Passholder, and lots of personal trial and errors, one (hopefully weekly) tip at a time. No product endorsements are intended in this week's Tip, though an Amazon Affiliate link is included to a category search should you wish to benefit MousePlanet at no extra cost to you. Get a belt and/or clip-mountable bottle holder! 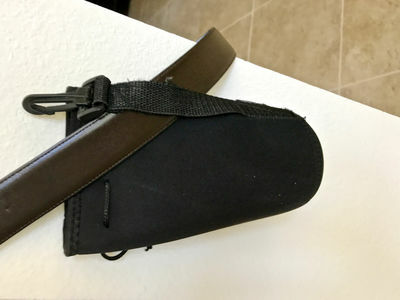 I have walked hundreds of miles around Central Florida, including the Four Walt Disney World Parks, with this belt and clip-attachable bottle holder sleeve. Photo by Alan S. Dalinka. Not long after I moved to Central Florida, I noticed that many front-line Walt Disney World Cast Members wore bottle holders on their belts or clipped on to their uniforms—especially (but not limited to) the folks in the parking lots, the PhotoPass photographers, custodial workers, and outdoor ride operators. It occurred to me that this is a fantastic way to keep a beverage handy, while also keeping hands free—for taking photos, holding on to rides, food and beverages, and so forth. The added benefit of neoprene is that it insulates a cold beverage against rapid warming in the heat of a Central Florida day (of course, your mileage will vary and folks debate which model is best). …La Nouba by Cirque du Soleil announced a new limited-time Florida Resident Family Pack offer. Now through April 29, groups of three or more can experience the Disney Springs show for as low as $32.25 per ticket for Category 3 seating, a more than 50 percent savings off the standard ticket price. Discounted Family Pack tickets are also available for Category 1, Category 2, and Front and Center. 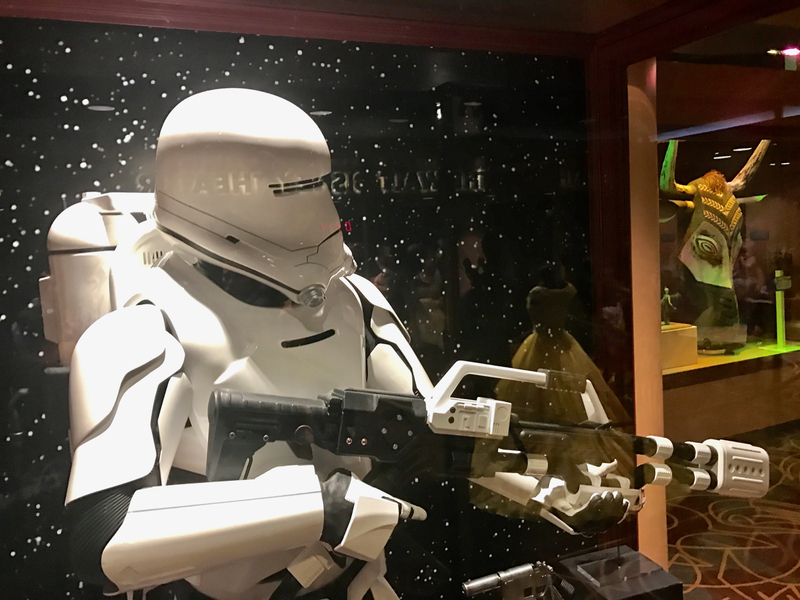 Florida residents can book by calling (407) 939-7328 or visiting the La Nouba box office located on the West Side of Disney Springs. Proof of Florida residency is required. Tickets and seating are subject to availability. Offer is not valid for previously purchased tickets, gift certificates or combined with any other discounts. …Delicious Disney: A Chef Series presents its next culinary event on February 22 at 6:30 p.m. at Markham's at Golden Oak, hosted by Disney's Animal Kingdom's Culinary Director Robert Adams and his Team. The theme of this event is a "Journey around the World of Flavors" presented with "unique and inspired culinary creations coupled with deliciously creative wine pairings." The price is $249/person (including tax and gratuity, plus an exclusive gift for Tables in Wonderland Members; discounts do not apply). Reservations may be booked by calling (407) 939-5773 daily between 9 a.m. and 5 p.m.
…In addition to Annual Passholders and Walt Disney World Resort hotel guests, everyone can now purchase the solid-color MagicBand 2 in the current eight solid colors—pink, blue, red, green, orange, gray, yellow, and purple—wherever MagicBands are sold throughout Walt Disney World Resort. Since the MagicBand 2 has the removable center icon (where the guts of the technology reside), as announced last Fall, MagicKeepers accessories are now available to give you more wearable options: the center icon can now be inserted into a silver carabiner or into a Mickey Mouse or Minnie Mouse lanyard clip to wear around your neck. Conveniently, each MagicKeeper includes a handy mini-screwdriver that helps you change out the icon. 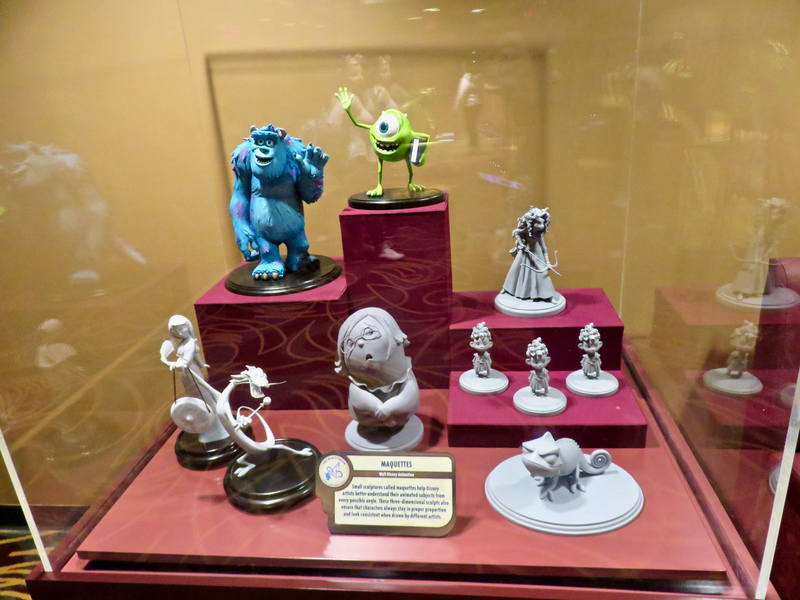 More details are on Disney Parks Blog. …Seemingly as soon as I mentioned in the last Update that Disney Parks Blog announced that Disney Vacation Club members that have affiliated their My Disney Experience account with their membership will see their Magic Bands now trigger a new purple-to-green color sequence at TouchPoints at the parks, water parks, DisneyQuest and ESPN Wide World of Sports Complex, my MagicBand stopped triggering the new color sequence this week. 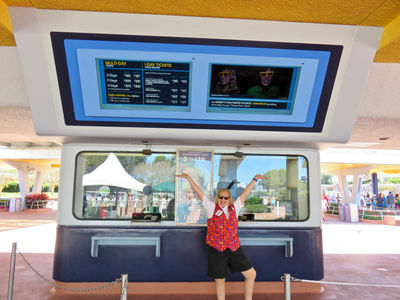 Cast members at the TouchPoints reported seeing the color display for some guests. 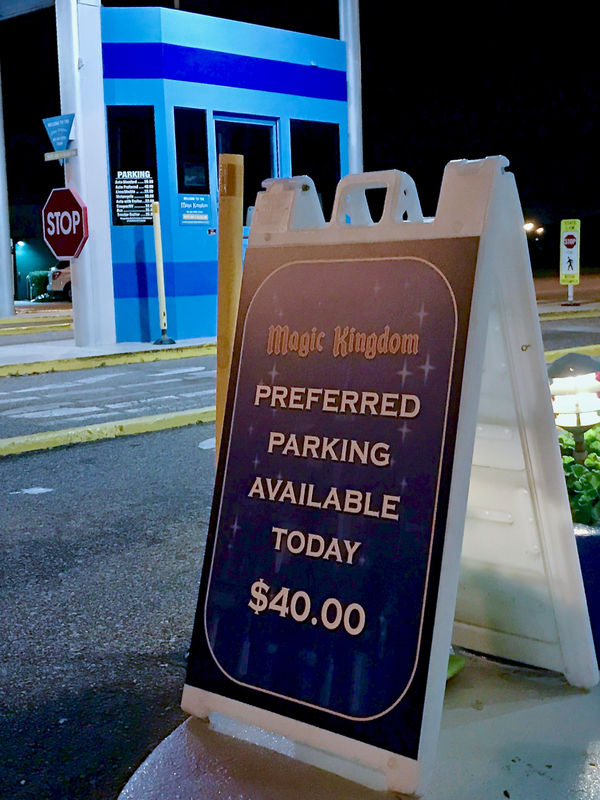 …At the competing resort a little bit north of Walt Disney World Resort on I-4, Universal Orlando Resort now offers free self-parking after 6 p.m. for all guests (no longer only Florida residents). Additional (unspecified) restrictions may apply and, not surprisingly, the offer is not valid during Halloween Horror Nights. 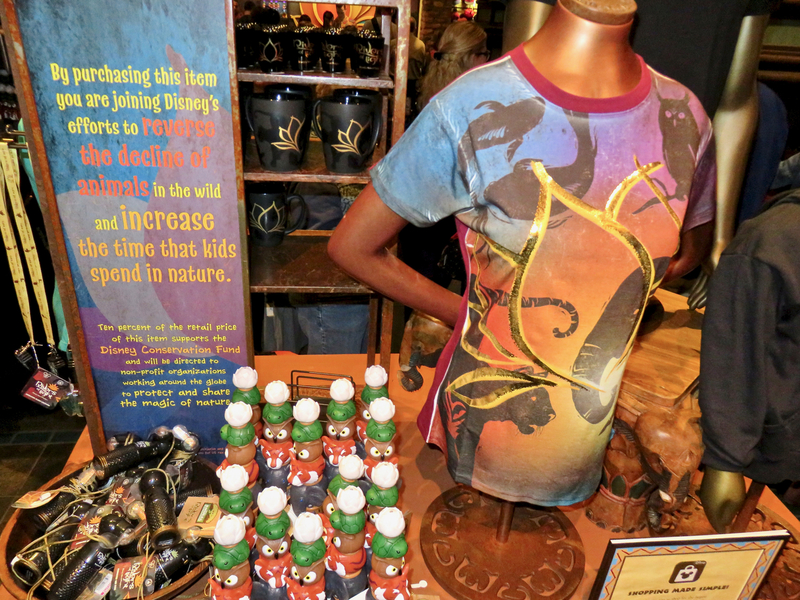 …MousePlanet's own Adrienne Vincent-Phoenix was quoted in in article in Orlando Sentinel about the new personal shopping option at Disney Springs. …Finally, your Weekly Update Writer, yours truly, was quoted on a premium episode of The Garry Meier Show Podcast last Thursday by Radio Hall of Fame inductee Garry Meier about the Disney Springs show drones and their potential future uses and relating to Lady Gaga's use of them in the Super Bowl Halftime show. Monday, Wednesday and Friday episodes of his show are free; Tuesday and Thursday are by paid subscription and, indeed, I am a paying subscriber! Disney After Hours at Magic Kingdom – March 2 & 9 (9 p.m.-12 a.m./midnight); February 2, 9 & 16 (8-11 p.m.). 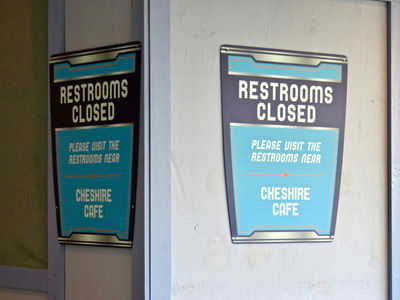 Note: Not all attraction closures have been officially confirmed by Disney, and are all subject to change at any time. 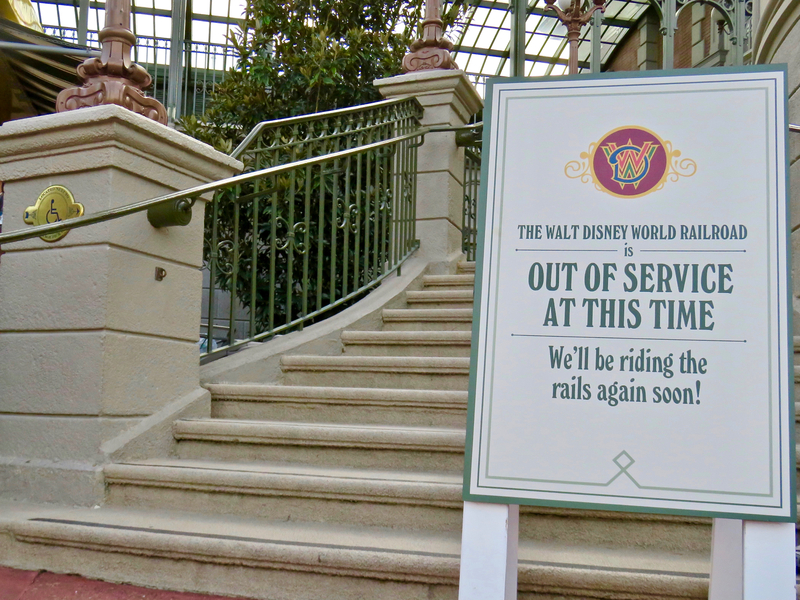 Refurbishment schedules are estimates only. We recommend checking for updates as you plan your visit. All information is subject to change without notice. 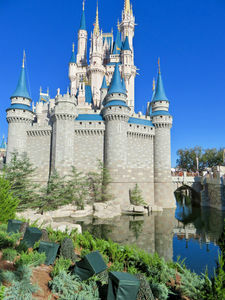 To get the most recent updates, visit DisneyWorld.com or use the MyDisneyExperience App on your iOS or Android device. 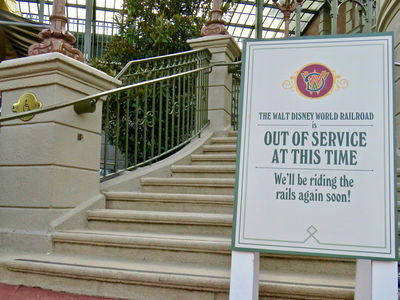 Walt Disney World Railroad refurbishment has closed Main Street Station but not its upper level platform which guests may use for parade viewing and other activities (except, of course, for the area reserved for VIP guests). Photo by Alan S. Dalinka. 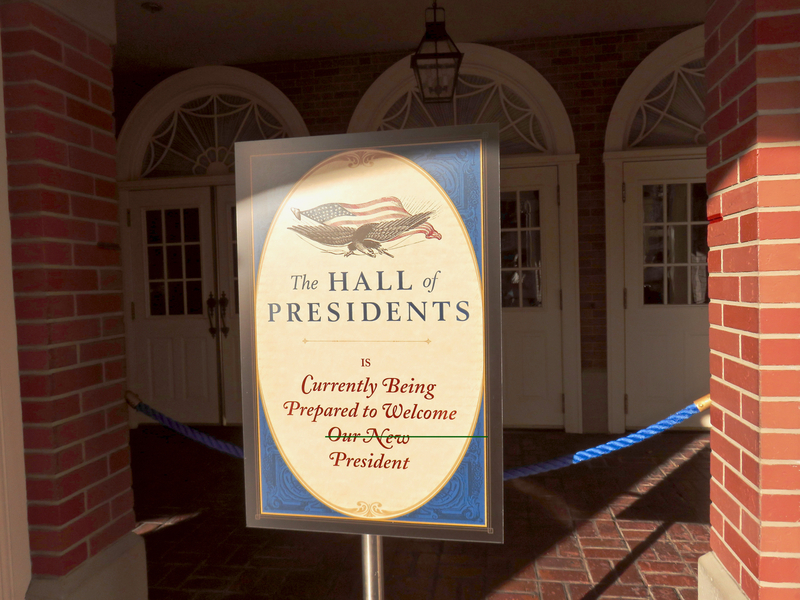 The Hall of Presidents – closed January 17, 2017 to add an audio-animatronic figure of the 45th president of the United States. Expected to reopen July, 2017. The Hall of Presidents is closed until this summer. Photo by Alan S. Dalinka. 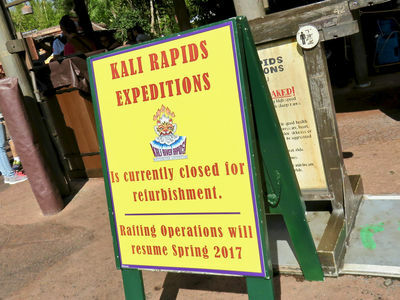 Kali River Rapids – closed January 3 – February 13, 2017 for refurbishment (or, based on the sign, perhaps longer). Kali River Rapids is closed for winter refurbishment. Photo by Alan S. Dalinka. 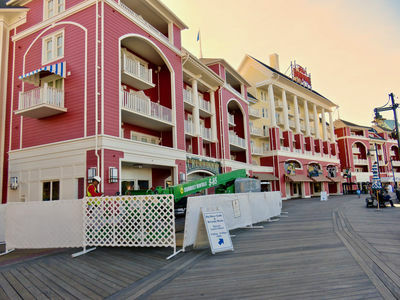 Fulton's Crab House – closed for refurbishment. Scheduled to reopen as Paddlefish on Saturday, February 4, 2017. Disney Quest – scheduled to close July 3, 2017 to make way for The NBA Experience. 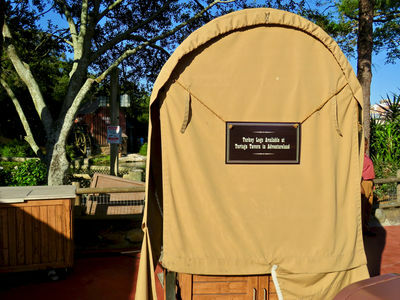 Wilderness Lodge and Villas – Hidden Springs pool, resort beach, playground, and Recreation fire pit closed. No opening date provided, but the pool is expected to be closed through 2017. Expect construction-related closures and noise due to construction of Disney Vacation Club's Copper Creek Villas & Cabins at Disney's Wilderness Lodge which is scheduled to open in 2017 (though not yet fully registered or available for sale). Disney's BoardWalk Villas – Luna Park Pool and slide closed until March 3; based on the signs, guests may be shuttled to Disney's Yacht & Beach Club's pools. 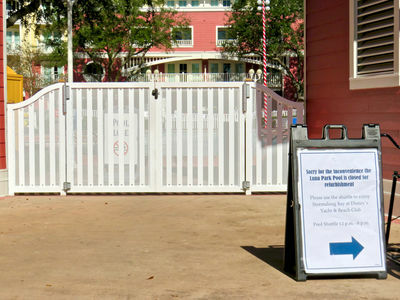 The Luna Park pool and slide at Disney's BoardWalk Villas is closed for refurbishment. Photo by Alan S. Dalinka. Another great update! 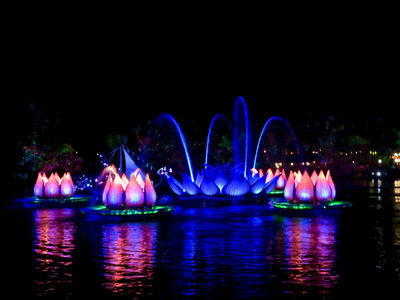 Rivers of Light looks really good, I can't wait to check that out. With the new Beauty and the Beast, Star Wars, etc. elements on display near the One Man's Dream theater, did that displace some/all of the miniature models of WD parks from other parts of the world (though I admit it's possibly my memory is a bit fuzzy, I thought those were right near the theater waiting area)? I always thought those miniature models of other parks made up a nice display. Sad to see them go, though I guess the rumored inevitable demise of OMD is probably still on the horizon, I'll have to just enjoy what's left of it until that day comes.